∼ 2010 ∼ December ∼ 23 ∼ Holiday Cheese! I LOVE CHEESE! LOVE IT! Cheese might possibly be my favorite food. Macaroni and cheese, grilled cheese sandwiches, cheese fondue…. you name it, I like it! I don’t eat a lot of it because it is high in cholesterol and fat, so when I do it is very special and I really enjoy it. A perfect appetizer to make around the holidays, that everyone loves, is a cheese platter. Cheese can get a bit confusing but what I like to do when making a cheese plate is just remember to have a nice variety. And use what you like! Don’t worry about what is appropriate. 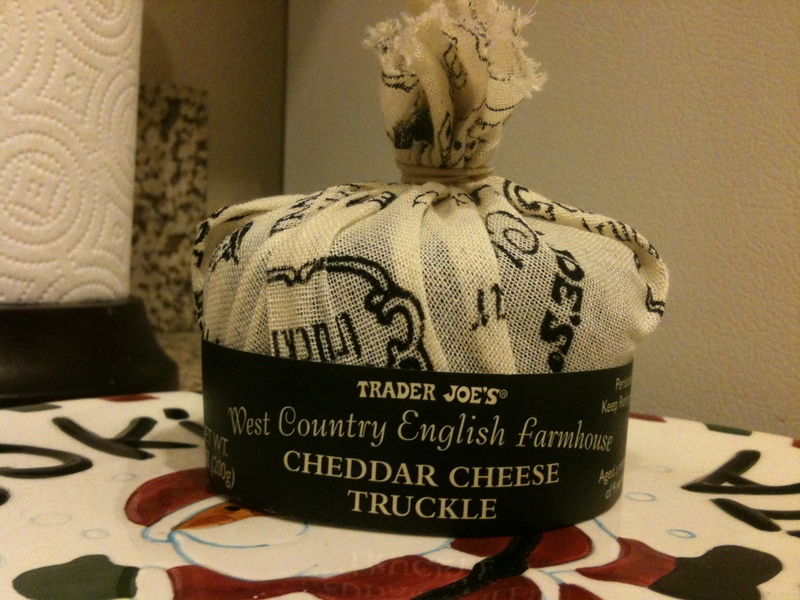 I found this AMAZING West Country English Farmhouse Cheddar Cheese Truckle from Trader Joe’s last week. They were passing out samples and I loved it so much that I immediately grabbed a package. It is very sharp and would go great with something sweet such as dried fruit. It is seasonal so it won’t be around much longer! Hurry into your local Trader Joe’s! You don’t want to miss this one!
. I like to use a good brie, cheddar and blue cheese… keep it simple. I will add some honey for the blue cheese, a variety of crackers or sliced bread, some grapes, olives, dried apricots and nuts. Some green leaves also can add nice color. Have fun with it! And don’t forget the wine!!! OMG OBSESSED!